The relationship between female pattern hair loss (FPHL) and androgenic hormones is not well established, but some evidence indicates oral finasteride may be efficacious in FPHL. 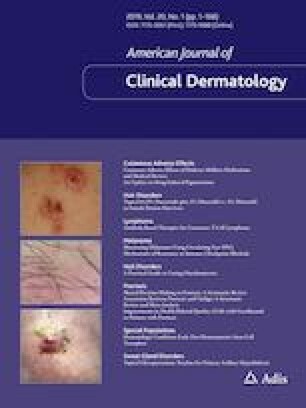 Use of a topical formulation has been proposed to minimize unwanted effects. Our objective was to compare the efficacy and safety of topical 0.25% finasteride combined with 3% minoxidil solution and 3% minoxidil solution as monotherapy in the treatment of FPHL. This was a prospective, randomized, double-blind study in 30 postmenopausal women with FPHL. Each participant was randomized to receive either topical 0.25% finasteride combined with topical 3% minoxidil or topical 3% minoxidil solution as monotherapy for 24 weeks. To determine efficacy, the hair density and diameter was measured and global photographic assessment was conducted at baseline and 8, 16, and 24 weeks. Side effects and serum dihydrotestosterone levels were also evaluated. By 24 weeks, hair density and diameter had increased in both groups, and finasteride/minoxidil was significantly superior to minoxidil solution in terms of hair diameter (p = 0.039). No systemic side effects were reported. However, serum dihydrotestosterone levels in the finasteride/minoxidil group significantly decreased from baseline (p = 0.016). A topical combination of 0.25% finasteride and 3% minoxidil may be a promising option in the treatment of FPHL with an additional benefit of increasing hair diameter. Nevertheless, as it may be absorbed percutaneously, it should be reserved for postmenopausal women. The authors thank the patients, investigators, and investigational site, whose participation made this study possible. PS, WI, and SR have no conflicts of interest that are directly relevant to the content of this study. This study was conducted in accordance with the principles of the Declaration of Helsinki and in compliance with the International Conference on Harmonization—Good Clinical Practice and local regulatory requirements. The study was reviewed and approved by the appropriate independent ethics committees, and written informed consent was obtained from all subjects prior to study initiation. This study was approved by the MU-IRB (Mahidol University Institutional Review Board) on 16 September 2015 (Protocol number 09-58-20).